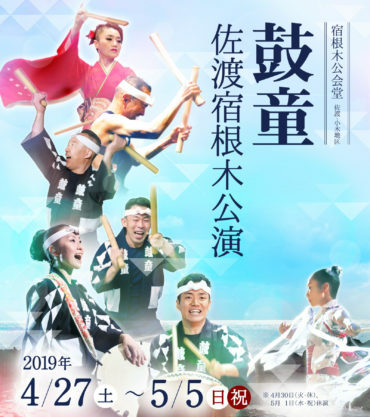 This spring, join Kodo on Sado Island for our eighth annual hometown concert series. You’re all invited to Shukunegi Community Hall, a cozy retro playhouse, to enjoy an up-close, rousing performance by a cast of seasoned veterans and energetic newcomers. The Kodo apprentices will make an appearance, too! Japan’s Golden Week is a great time of year to visit us at home on beautiful Sado. We’re waiting for you! Yoshikazu Fujimoto, Chieko Kojima, Tomohiro Mitome, Yoshie Abe, Mitsuru Ishizuka, Yuta Sumiyoshi, Tomoe Miura, et al. *Cast may be subject to change. Running time is approx. one hour. Group Discount: 10% off each ticket for groups of 10 or more. *Available to people who live or work on Sado Island. 3-min. walk from “Shukunegi” bus stop on the Niigata Kotsu Sado Ogi Line. By car: Approx. 15 mins. from Ogi Port, 45 mins. from Akadomari Port, 75 mins. from Ryotsu Port. 10-min. drive from Sado Island Taiko Centre (Tatakokan).